All Terrain Runner (ATR) is a new official series comprising races of varying distances, seasons and surfaces. 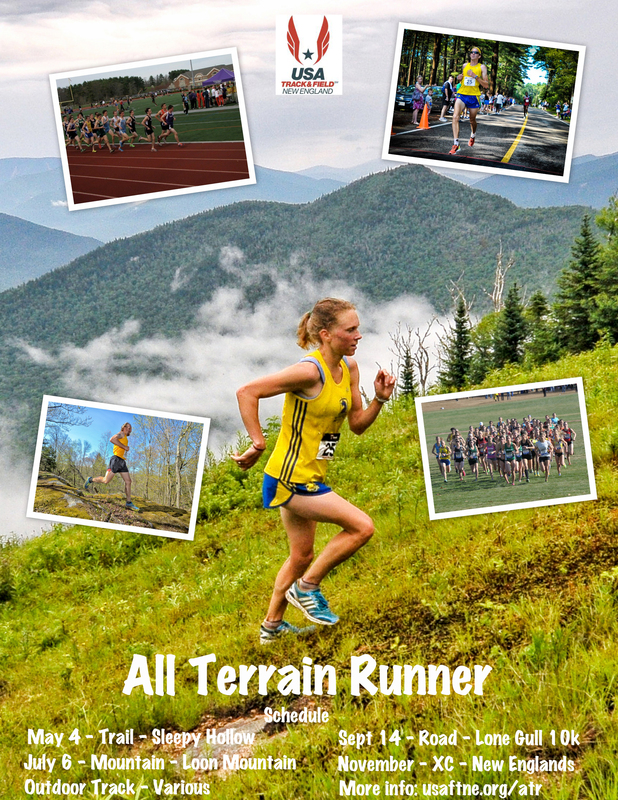 The series begins with a trail race (the New England trail championships), before competitors race on the track, mountains and roads, closing with a cross country event in the fall. USATF-NE members may submit their own 5000 meter result from any USATF sanctioned track meet through our web form during this time frame. A competitor may complete several outdoor 5000 meter races. However only the fastest time will count in the final scoring. Submit your 5000 meter Track Performance. Cash prizes will also be awarded to age group winners in the following age divisions: 40-49, 50-59 and 60-69. To be considered for a place in the final standings, competitors must complete four out of the five races, and participants who complete all five events will receive a special series t-shirt. Scoring will done by assigning 100 pts to the winner and then the rest of the field will be assigned scores based on their percentage behind the winner. There is no additional cost to be a part of this, beyond the registration fees for each individual race. To be eligible you must be a USATF-NE member in good standing. Click here to enter your 5000 meter Track Performances. More details on the ATR series coming soon. For any questions, please contact: Eric Narcisi: enarcisi@usatfne.org. Click here to download the ATR poster (5.7 MB).